Expecting a terra incognita, I found myself instead in the land of déjà vu. The lexicon of The Wall Street Journal and the business sections of Time and Newsweek turned out to bear a striking resemblance to Genesis, the Epistle to the Romans, and Saint Augustine's City of God. Behind descriptions of market reforms, monetary policy, and the convolutions of the Dow, I gradually made out the pieces of a grand narrative about the inner meaning of human history, why things had gone wrong, and how to put them right. Theologians call these myths of origin, legends of the fall, and doctrines of sin and redemption. But here they were again, and in only thin disguise: chronicles about the creation of wealth, the seductive temptations of statism, captivity to faceless economic cycles, and, ultimately, salvation through the advent of free markets, with a small dose of ascetic belt tightening along the way, especially for the East Asian economies. The East Asians' troubles, votaries argue, derive from their heretical deviation from free-market orthodoxy—they were practitioners of "crony capitalism," of "ethnocapitalism," of "statist capitalism," not of the one true faith. The East Asian financial panics, the Russian debt repudiations, the Brazilian economic turmoil, and the U.S. stock market's $1.5 trillion "correction" momentarily shook belief in the new dispensation. 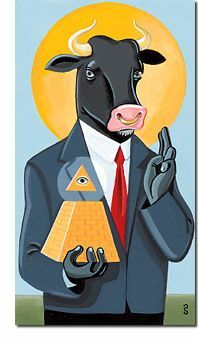 But faith is strengthened by adversity, and the Market God is emerging renewed from its trial by financial "contagion." Since the argument from design no longer proves its existence, it is fast becoming a postmodern deity—believed in despite the evidence. Alan Greenspan vindicated this tempered faith in testimony before Congress last October. A leading hedge fund had just lost billions of dollars, shaking market confidence and precipitating calls for new federal regulation. Greenspan, usually Delphic in his comments, was decisive. He believed that regulation would only impede these markets, and that they should continue to be self-regulated. True faith, Saint Paul tells us, is the evidence of things unseen. Soon I began to marvel at just how comprehensive the business theology is. There were even sacraments to convey salvific power to the lost, a calendar of entrepreneurial saints, and what theologians call an "eschatology"—a teaching about the "end of history." My curiosity was piqued. I began cataloguing these strangely familiar doctrines, and I saw that in fact there lies embedded in the business pages an entire theology, which is comparable in scope if not in profundity to that of Thomas Aquinas or Karl Barth. It needed only to be systematized for a whole new Summa to take shape. At the apex of any theological system, of course, is its doctrine of God. In the new theology this celestial pinnacle is occupied by The Market, which I capitalize to signify both the mystery that enshrouds it and the reverence it inspires in business folk. Different faiths have, of course, different views of the divine attributes. In Christianity, God has sometimes been defined as omnipotent (possessing all power), omniscient (having all knowledge), and omnipresent (existing everywhere). Most Christian theologies, it is true, hedge a bit. They teach that these qualities of the divinity are indeed there, but are hidden from human eyes both by human sin and by the transcendence of the divine itself. In "light inaccessible" they are, as the old hymn puts it, "hid from our eyes." Likewise, although The Market, we are assured, possesses these divine attributes, they are not always completely evident to mortals but must be trusted and affirmed by faith. "Further along," as another old gospel song says, "we'll understand why." As I tried to follow the arguments and explanations of the economist-theologians who justify The Market's ways to men, I spotted the same dialectics I have grown fond of in the many years I have pondered the Thomists, the Calvinists, and the various schools of modern religious thought. In particular, the econologians' rhetoric resembles what is sometimes called "process theology," a relatively contemporary trend influenced by the philosophy of Alfred North Whitehead. In this school although God wills to possess the classic attributes, He does not yet possess them in full, but is definitely moving in that direction. This conjecture is of immense help to theologians for obvious reasons. It answers the bothersome puzzle of theodicy: why a lot of bad things happen that an omnipotent, omnipresent, and omniscient God—especially a benevolent one—would not countenance. Process theology also seems to offer considerable comfort to the theologians of The Market. It helps to explain the dislocation, pain, and disorientation that are the result of transitions from economic heterodoxy to free markets. Since the earliest stages of human history, of course, there have been bazaars, rialtos, and trading posts—all markets. But The Market was never God, because there were other centers of value and meaning, other "gods." The Market operated within a plethora of other institutions that restrained it. As Karl Polanyi has demonstrated in his classic work The Great Transformation, only in the past two centuries has The Market risen above these demigods and chthonic spirits to become today's First Cause. Initially The Market's rise to Olympic supremacy replicated the gradual ascent of Zeus above all the other divinities of the ancient Greek pantheon, an ascent that was never quite secure. Zeus, it will be recalled, had to keep storming down from Olympus to quell this or that threat to his sovereignty. Recently, however, The Market is becoming more like the Yahweh of the Old Testament—not just one superior deity contending with others but the Supreme Deity, the only true God, whose reign must now be universally accepted and who allows for no rivals. Divine omnipotence means the capacity to define what is real. It is the power to make something out of nothing and nothing out of something. The willed-but-not-yet-achieved omnipotence of The Market means that there is no conceivable limit to its inexorable ability to convert creation into commodities. But again, this is hardly a new idea, though it has a new twist. In Catholic theology, through what is called "transubstantiation," ordinary bread and wine become vehicles of the holy. In the mass of The Market a reverse process occurs. Things that have been held sacred transmute into interchangeable items for sale. Land is a good example. For millennia it has held various meanings, many of them numinous. It has been Mother Earth, ancestral resting place, holy mountain, enchanted forest, tribal homeland, aesthetic inspiration, sacred turf, and much more. But when The Market's Sanctus bell rings and the elements are elevated, all these complex meanings of land melt into one: real estate. At the right price no land is not for sale, and this includes everything from burial grounds to the cove of the local fertility sprite. This radical desacralization dramatically alters the human relationship to land; the same happens with water, air, space, and soon (it is predicted) the heavenly bodies. At the high moment of the mass the priest says, "This is my body," meaning the body of Christ and, by extension, the bodies of all the faithful people. Christianity and Judaism both teach that the human body is made "in the image of God." Now, however, in a dazzling display of reverse transubstantiation, the human body has become the latest sacred vessel to be converted into a commodity. The process began, fittingly enough, with blood. But now, or soon, all bodily organs—kidneys, skin, bone marrow, sperm, the heart itself—will be miraculously changed into purchasable items. Still, the liturgy of The Market is not proceeding without some opposition from the pews. A considerable battle is shaping up in the United States, for example, over the attempt to merchandise human genes. A few years ago, banding together for the first time in memory, virtually all the religious institutions in the country, from the liberal National Council of Churches to the Catholic bishops to the Christian Coalition, opposed the gene mart, the newest theophany of The Market. But these critics are followers of what are now "old religions," which, like the goddess cults that were thriving when the worship of the vigorous young Apollo began sweeping ancient Greece, may not have the strength to slow the spread of the new devotion. Occasionally backsliders try to bite the Invisible Hand that feeds them. On October 26, 1996, the German government ran an ad offering the entire village of Liebenberg, in what used to be East Germany, for sale—with no previous notice to its some 350 residents. Liebenberg's citizens, many of them elderly or unemployed, stared at the notice in disbelief. They had certainly loathed communism, but when they opted for the market economy that reunification promised, they hardly expected this. Liebenberg includes a thirteenth-century church, a Baroque castle, a lake, a hunting lodge, two restaurants, and 3,000 acres of meadow and forest. Once a favorite site for boar hunting by the old German nobility, it was obviously entirely too valuable a parcel of real estate to overlook. Besides, having been expropriated by the East German Communist government, it was now legally eligible for sale under the terms of German reunification. Overnight Liebenberg became a living parable, providing an invaluable glimpse of the Kingdom in which The Market's will is indeed done. But the outraged burghers of the town did not feel particularly blessed. They complained loudly, and the sale was finally postponed. Everyone in town realized, however, that it was not really a victory. The Market, like Yahweh, may lose a skirmish, but in a war of attrition it will always win in the end. Of course, religion in the past has not been reluctant to charge for its services. Prayers, masses, blessings, healings, baptisms, funerals, and amulets have been hawked, and still are. Nor has religion always been sensitive to what the traffic would bear. When, in the early sixteenth century, Johann Tetzel jacked up the price of indulgences and even had one of the first singing commercials composed to push sales ("When the coin into the platter pings, the soul out of purgatory springs"), he failed to realize that he was overreaching. The customers balked, and a young Augustinian monk brought the traffic to a standstill with a placard tacked to a church door. It would be a lot harder for a Luther to interrupt sales of The Market's amulets today. As the people of Liebenberg discovered, everything can now be bought. Lakes, meadows, church buildings—everything carries a sticker price. But this practice itself exacts a cost. As everything in what used to be called creation becomes a commodity, human beings begin to look at one another, and at themselves, in a funny way, and they see colored price tags. There was a time when people spoke, at least occasionally, of "inherent worth"—if not of things, then at least of persons. The Liebenberg principle changes all that. One wonders what would become of a modern Luther who tried to post his theses on the church door, only to find that the whole edifice had been bought by an American billionaire who reckoned it might look nicer on his estate. It is comforting to note that the citizens of Liebenberg, at least, were not put on the block. But that raises a good question. What is the value of a human life in the theology of The Market? Here the new deity pauses, but not for long. The computation may be complex, but it is not impossible. We should not believe, for example, that if a child is born severely handicapped, unable to be "productive," The Market will decree its death. One must remember that the profits derived from medications, leg braces, and CAT-scan equipment should also be figured into the equation. Such a cost analysis might result in a close call—but the inherent worth of the child's life, since it cannot be quantified, would be hard to include in the calculation. It is sometimes said that since everything is for sale under the rule of The Market, nothing is sacred. But this is not quite true. About three years ago a nasty controversy erupted in Great Britain when a railway pension fund that owned the small jeweled casket in which the remains of Saint Thomas à Becket are said to have rested decided to auction it off through Sotheby's. The casket dates from the twelfth century and is revered as both a sacred relic and a national treasure. The British Museum made an effort to buy it but lacked the funds, so the casket was sold to a Canadian. Only last-minute measures by the British government prevented removal of the casket from the United Kingdom. In principle, however, in the theology of The Market, there is no reason why any relic, coffin, body, or national monument—including the Statue of Liberty and Westminster Abbey—should not be listed. Does anyone doubt that if the True Cross were ever really discovered, it would eventually find its way to Sotheby's? The Market is not omnipotent—yet. But the process is under way and it is gaining momentum. Omniscience is a little harder to gauge than omnipotence. Maybe The Market has already achieved it but is unable—temporarily—to apply its gnosis until its Kingdom and Power come in their fullness. Nonetheless, current thinking already assigns to The Market a comprehensive wisdom that in the past only the gods have known. The Market, we are taught, is able to determine what human needs are, what copper and capital should cost, how much barbers and CEOs should be paid, and how much jet planes, running shoes, and hysterectomies should sell for. But how do we know The Market's will? In days of old, seers entered a trance state and then informed anxious seekers what kind of mood the gods were in, and whether this was an auspicious time to begin a journey, get married, or start a war. The prophets of Israel repaired to the desert and then returned to announce whether Yahweh was feeling benevolent or wrathful. Today The Market's fickle will is clarified by daily reports from Wall Street and other sensory organs of finance. Thus we can learn on a day-to-day basis that The Market is "apprehensive," "relieved," "nervous," or even at times "jubilant." On the basis of this revelation awed adepts make critical decisions about whether to buy or sell. Like one of the devouring gods of old, The Market—aptly embodied in a bull or a bear—must be fed and kept happy under all circumstances. True, at times its appetite may seem excessive—a $35 billion bailout here, a $50 billion one there—but the alternative to assuaging its hunger is too terrible to contemplate. The diviners and seers of The Market's moods are the high priests of its mysteries. To act against their admonitions is to risk excommunication and possibly damnation. Today, for example, if any government's policy vexes The Market, those responsible for the irreverence will be made to suffer. That The Market is not at all displeased by downsizing or a growing income gap, or can be gleeful about the expansion of cigarette sales to Asian young people, should not cause anyone to question its ultimate omniscience. Like Calvin's inscrutable deity, The Market may work in mysterious ways, "hid from our eyes," but ultimately it knows best. Omniscience can sometimes seem a bit intrusive. The traditional God of the Episcopal Book of Common Prayer is invoked as one "unto whom all hearts are open, all desires known, and from whom no secrets are hid." Like Him, The Market already knows the deepest secrets and darkest desires of our hearts—or at least would like to know them. But one suspects that divine motivation differs in these two cases. Clearly The Market wants this kind of x-ray omniscience because by probing our inmost fears and desires and then dispensing across-the-board solutions, it can further extend its reach. Like the gods of the past, whose priests offered up the fervent prayers and petitions of the people, The Market relies on its own intermediaries: motivational researchers. Trained in the advanced art of psychology, which has long since replaced theology as the true "science of the soul," the modern heirs of the medieval confessors delve into the hidden fantasies, insecurities, and hopes of the populace. One sometimes wonders, in this era of Market religion, where the skeptics and freethinkers have gone. What has happened to the Voltaires who once exposed bogus miracles, and the H. L. Menckens who blew shrill whistles on pious humbuggery? Such is the grip of current orthodoxy that to question the omniscience of The Market is to question the inscrutable wisdom of Providence. The metaphysical principle is obvious: If you say it's the real thing, then it must be the real thing. As the early Christian theologian Tertullian once remarked, "Credo quia absurdum est" ("I believe because it is absurd"). Finally, there is the divinity's will to be omnipresent. Virtually every religion teaches this idea in one way or another, and the new religion is no exception. The latest trend in economic theory is the attempt to apply market calculations to areas that once appeared to be exempt, such as dating, family life, marital relations, and child-rearing. Henri Lepage, an enthusiastic advocate of globalization, now speaks about a "total market." Saint Paul reminded the Athenians that their own poets sang of a God "in whom we live and move and have our being"; so now The Market is not only around us but inside us, informing our senses and our feelings. There seems to be nowhere left to flee from its untiring quest. Like the Hound of Heaven, it pursues us home from the mall and into the nursery and the bedroom. It used to be thought—mistakenly, as it turns out—that at least the innermost, or "spiritual," dimension of life was resistant to The Market. It seemed unlikely that the interior castle would ever be listed by Century 21. But as the markets for material goods become increasingly glutted, such previously unmarketable states of grace as serenity and tranquillity are now appearing in the catalogues. Your personal vision quest can take place in unspoiled wildernesses that are pictured as virtually unreachable—except, presumably, by the other people who read the same catalogue. Furthermore, ecstasy and spirituality are now offered in a convenient generic form. Thus The Market makes available the religious benefits that once required prayer and fasting, without the awkwardness of denominational commitment or the tedious ascetic discipline that once limited their accessibility. All can now handily be bought without an unrealistic demand on one's time, in a weekend workshop at a Caribbean resort with a sensitive psychological consultant replacing the crotchety retreat master. Discovering the theology of The Market made me begin to think in a different way about the conflict among religions. Violence between Catholics and Protestants in Ulster or Hindus and Muslims in India often dominates the headlines. But I have come to wonder whether the real clash of religions (or even of civilizations) may be going unnoticed. I am beginning to think that for all the religions of the world, however they may differ from one another, the religion of The Market has become the most formidable rival, the more so because it is rarely recognized as a religion. The traditional religions and the religion of the global market, as we have seen, hold radically different views of nature. In Christianity and Judaism, for example, "the earth is the Lord's and the fullness thereof, the world and all that dwell therein." The Creator appoints human beings as stewards and gardeners but, as it were, retains title to the earth. Other faiths have similar ideas. In the Market religion, however, human beings, more particularly those with money, own anything they buy and—within certain limits—can dispose of anything as they choose. Other contradictions can be seen in ideas about the human body, the nature of human community, and the purpose of life. The older religions encourage archaic attachments to particular places. But in The Market's eyes all places are interchangeable. The Market prefers a homogenized world culture with as few inconvenient particularities as possible. No religion, new or old, is subject to empirical proof, so what we have is a contest between faiths. Much is at stake. The Market, for example, strongly prefers individualism and mobility. Since it needs to shift people to wherever production requires them, it becomes wrathful when people cling to local traditions. These belong to the older dispensations and—like the high places of the Baalim—should be plowed under. But maybe not. Like previous religions, the new one has ingenious ways of incorporating pre-existing ones. Hindu temples, Buddhist festivals, and Catholic saints' shrines can look forward to new incarnations. Along with native costumes and spicy food, they will be allowed to provide local color and authenticity in what could otherwise turn out to be an extremely bland Beulah Land. There is, however, one contradiction between the religion of The Market and the traditional religions that seems to be insurmountable. All of the traditional religions teach that human beings are finite creatures and that there are limits to any earthly enterprise. A Japanese Zen master once said to his disciples as he was dying, "I have learned only one thing in life: how much is enough." He would find no niche in the chapel of The Market, for whom the First Commandment is "There is never enough." Like the proverbial shark that stops moving, The Market that stops expanding dies. That could happen. If it does, then Nietzsche will have been right after all. He will just have had the wrong God in mind.